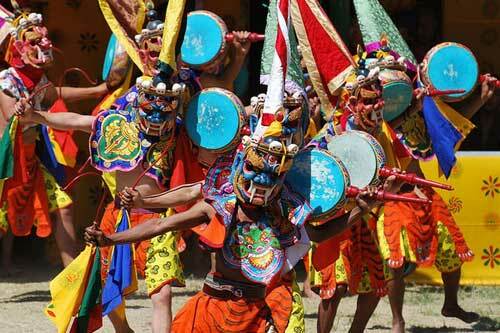 Punakha Festival an annual festival, which is celebrated to commemorate the victories over the Tibetans. During this festival, you will find the pazaps or local militia men are dressed in battle gear to showcase a battle scene, which will offer a unique and thrilling experience. 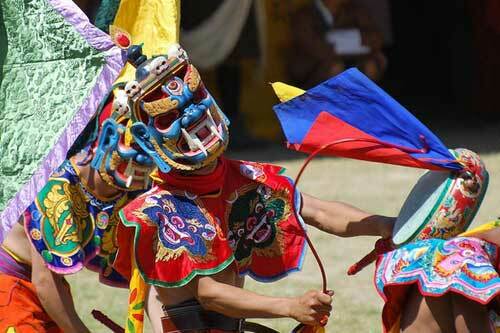 Very colorful typical mask dances and wonderful enactments in a Punakha festival will leave you mesmerized. 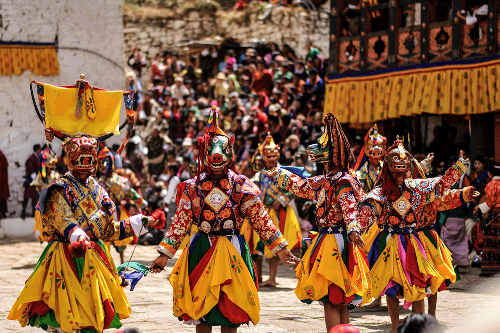 On a guided Punakha festival tour, you will not only witness a lively festival but also get an opportunity to enjoy in a spectacular sightseeing. 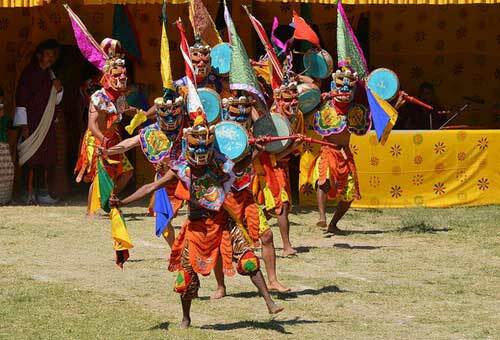 Punakha Valley is located in the western part of Bhutan that host spectacular Punakha festival, in which colorful and well choreographed mask dances are preformed. 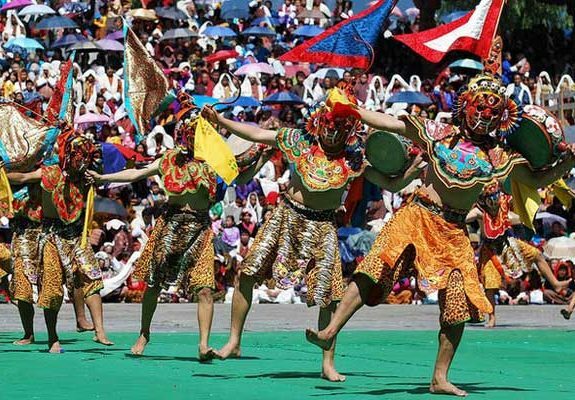 Bhutan Buddha Travellers will leave no stone unturned to help you in experience one of the popular and unique Punakha festival in Bhutan is a convenient and comfortable way. From your arrival to departure, our experienced team of travel consultants will arrange everything in a well planned and organized way. 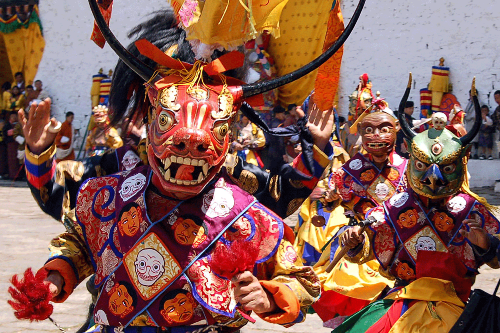 By keeping in mind your requirement, we will make sure to offer you a fun filled and guided Punakha festival tour in Bhutan. Thimpu sightseeing- Handmade paper Mill, School of Arts and crafts, pass by Memorial Chorten (temple) and Visit Changangkha Lhakhang. Drive through Dochula pass and hike to Chimi Lhakhang (temple of fertility). 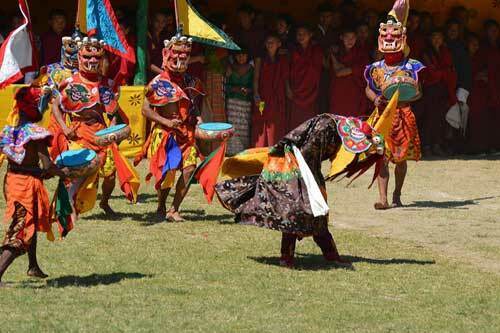 Attend the Punakha Festival as well as visit Khamsum Yulay Temple or Wangdue excursion visit Rinchingang. Visit Gangtey Gompa, which is the largest and the only monastery of the Nyingmapa sect in western Bhutan. Explore Gangtey monastery, which is a richly renovated monastery offering rich architecture and paintings. Visit the National Museum, 17 century Paro Dzong (Fortress), Kichu Lhakhang, Drukgyal Dzong (Fortress) and hike to Tiger’s Nest in Paro. 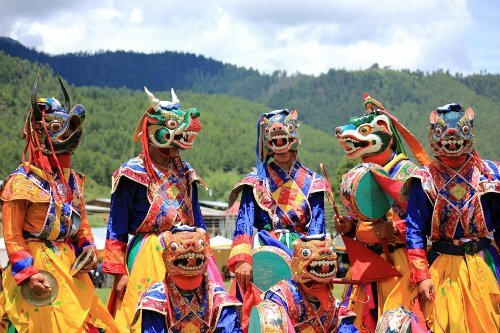 Detailed Itinerary Day 01| Arrival in Paro – Thimphu (1.2 Hrs) Upon arrival our guide will receive you and transfer to Thimphu. One can wander on your own to stroll Thimphu streets or relax in your hotel. Overnight: Thimphu | Altitude: 2300m Day 02| Thimphu sightseeing Morning visit the weekend market (Thursday, Friday, Saturday & Sunday), Handmade paper Mill, School of Arts and crafts where students learn 13 different arts used predominantly in Bhutan, Lunch in town. Drive pass by Memorial Chorten (temple) built in memory of the late 3rd King. Visit Changangkha Lhakhang, the oldest temple in the valley, Enclosure where national animal, Takin are kept and Zilukha Nunnery. Overnight: Thimphu Day 03| Thimphu – Punakha (2.5 Hrs) Drive through Dochula pass at 3010m. When the weather permits one can enjoy a spectacular view of the highest mountains of Bhutan at a site that stretches almost 180 degrees. After a short tea break continue to sub tropical Punakha. Afternoon we will hike to Chimi Lhakhang, temple of fertility which is associated with religious arts of phallus. Overnight: Punakha | Altitude: 1350m Day 04| Punakha Festival We will spend whole day in the festival which will accompany with various mask dances and folk dancers along with jokers actions in the crowd. 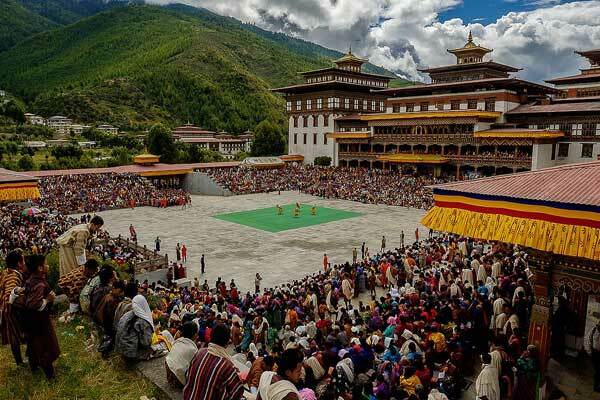 Overnight at Punakha Day 05| Punakha Festival Whole day in the interesting Punakha festival or in the afternoon we can proceed for other sightseeing like visiting Khamsum Yulay Temple or Wangdue excursion visit Rinchingang. Overnight in Punakha Day 06| Punakha – Phobjikha (3 Hrs) Check out of the hotel and visit Chimi Lhakhang on foot, the temple of fertility associated with religious art of phallus. En route visit Wangdi town and continue to Phobjikha over the second highest road pass on your trip at 3140m.Visit Gangtey Gompa, the largest and the only monastery of the Nyingmapa sect in western Bhutan. Evening relax in your hotel or take a stroll. Overnight: Phobjikha | Altitude: 2900m Day 07| Phobjikha halt Morning go for walk and meet the School children close to your hotel, who all walk for hours to reach their nearest school. Phobjikha is a paradise for nature lovers and hikers. There are lots of great places for hikes around the valley. Visit Gangtey monastery, the richly renovated monastery offering rich architecture and paintings. Walk down to the valley through the village for your hotel. Overnight: Phobjikha Day 08| Phobjikha – Paro (6 Hrs) Start early retracing the drive to Paro. In Paro visit the National Museum, the first of its kind which has a collection from natural history to religious paintings. Visit 17 century Paro Dzong (Fortress) on foot and continue walking through the oldest wooden bridge still in use. Evening stroll old Paro town and peep into some local handicrafts stores. One can also venture to try local restaurant for dinner. Overnight: Paro | Altitude: 2200m Day 09| Paro Sightseeing Visit Kichu Lhakhang, one from the 2 oldest temple in the country, historic Drukgyal Dzong (Fortress) and hike to Tiger’s Nest, the most revered temple in the country that literally hangs on a granite cliff overlooking the Paro Valley. Evening at leisure Overnight: Paro Day 10| Departure Morning transfer to the airport (15 mins) for your departure flight. Our tour staff will bid you farewell at the airport.